The world needs a hero. And you're not it. No, the actual hero already killed the aliens, won the war, saved humanity and got rich, famous and all the girls. As usual. You are the janitor who needs to clean up after said hero because everything is now a mess. Tasks include gathering and disposing of debris (e.g. dismembered bodies of aliens and humans), restocking of first aid kits, repairing bullet holes in walls, and cleaning of blood spatters and soot marks from floors, walls and ceilings. As a steam review summarized this: "Better than cleaning my room. 11/10." Best Santa's Rampage time with All Items: 0:00:54 by Christian 'ShadowDraft' Moll on 2014-02-16. Best Shadow Warrior time with All Items: 0:01:59 by Christian 'ShadowDraft' Moll on 2014-04-30. Santa's Rampage All Items: 0:00:54 by Christian Moll. 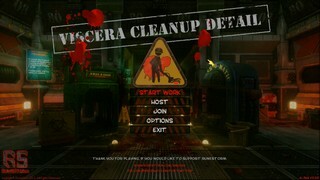 Welcome to the Viscera Cleanup Detail series. I'll be your guide, ShadowDraft. For this submission we have the Santa's Rampage spinoff and the category is All Collectibles. There's no difficulty or enemies just collecting items tracked by the ingame monitor. This run is fairly fast paced with less than a minute runtime. Tricks/glitches used in this run are simply abusing the broken physics engine by boosting over objects on the floor. Run starts off with the menu and loading screen. Timing starts after the screen finishes as you can already move. I proceed to grab the first four objects which are the Rooks Keep figurines. After those four are in the box I collect all toy guns six in total. Now we head down to the basement to get Rudolf's red nose. The last item on the list is Santa's shotgun. To check if everything is collected I trigger the ingame monitor which shows the full list before I clock off. Shadow Warrior All Items: 0:01:59 by Christian Moll. For this submission we have the Shadow Warrior spinoff and the category is Cash Only. There's no difficulty or enemies just collecting the two million dollars tracked by the ingame monitor. This run is fairly fast paced with less than two minutes runtime. I get a decent spawning position and cut every corner closely. The first cash is hidden inside a corpse part which you have to grab to release the money. There's also a few scattered around without being hidden inside another object. I quickly gather up the first 5 locations and proceed towards the next room. I take the box with me as it's easier to collect the money. After collecting two more I grab the briefcase and get the best possible throw into the box. Now I can go into the next room to finish up the two million dollars collection. The first few locations are all handled separately but I put the two cash items into a disposal bin as it saves a considerable amount of time over going back and forth. I get an alright throw over the stairs and I go to collect the last two locations upstairs. After throwing all the cash into the box I can leave for the monitor. Run ends with clocking off.